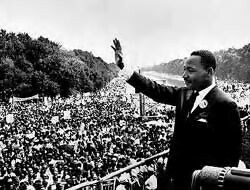 In remembrance of Dr. Martin Luther King, Jr., take some time to read his "I Have a Dream" speech. Also, there are quite a few pieces extolling the inherent conservatism (and Republicanism) of Dr. King. For instance, the Heritage Foundation held a lecture in 1993 concerning "The Conservative Virtues of Dr. Martin Luther King" and posted a piece about "Martin Luther King's Conservative Legacy" last year. Then there is a new piece by Francis Rice explaining "Why Martin Luther King Was Republican." Finally, Andrew Busch responds to some criticism he received on an earlier piece he had written on Dr. King and Conservatism. I suppose it could appear as if I'm overly-politicizing here. Yet, my intention is to present the conservative viewpoint on Dr. King in hopes of showing that he did indeed speak to--and for--all Americans.